A HUGE spider, dangling for dear life on a branch overhanging a raging river, has been rescued from the Queensland floods. Yes, you heard that right, in the same way you would pull a fluffy stranded sheep to safety, an enormous arachnid was rescued. The spider was found perched precariously on a flimsy twig in a desperate attempt to stay away from the Herbert river in Halifax, near Ingham, engorged following a week of torrential rain. In the past four days, the sheer amount of rainfall has seen the region between Townsville and Cairns declared a disaster zone by the state government. 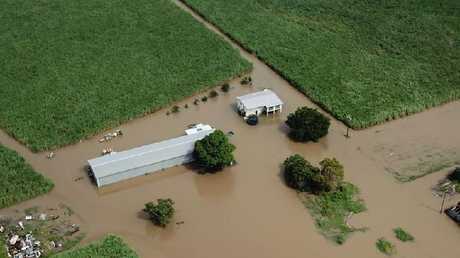 The state's north west is suffering through the worst flooding since 2009. 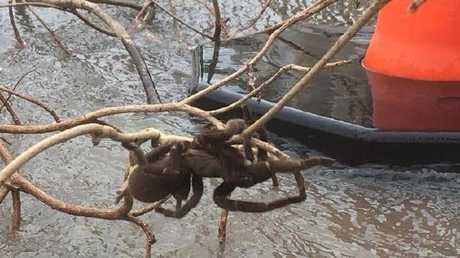 The enormous spider found precariously perched above a flooded river in Halifax, Queensland. Picture: Andrew Giliberto. The area close to Halifax has seen more than 500mm of rain since 1 March. Andrew Gilberto uploaded the video of the spider, which was spotted close to Halifax's Spar supermarket. 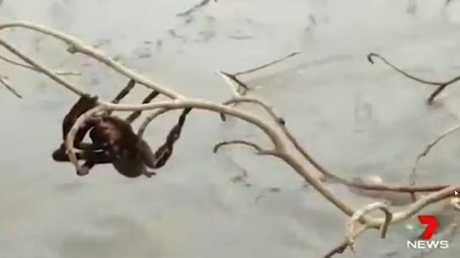 Channel 9 reported that the locals, clearly with a soft spot for the creature, plucked the branch from above the river with the spider attached. It was then placed on an avocado tree in the town centre away from the flooded waters; but significantly closer to humans. The spider was rescued and placed in a tree in the town centre. Picture: Andrew Giliberto/Channel7. It's not the only critter spotted in the floodwaters. Video has also been uploaded of snakes in the river while a crocodile lunged at a car. It comes as a group of Year 6 students who had been isolated by floodwaters were today being flown out in an evacuation timed to beat more wet weather expected, reported the Courier Mail. Halifax has been hit hard by the flooding. Picture: Mitch Knuth. More than 70 students and staff had been trapped at the Echo Creek adventure park near Tully since last Monday. The first group of the staged rescue was flown out before noon. The Bureau of Meteorology says the weekend's heavy rain is now easing, however there are signs a cyclone may be forming off the state's far north coast. This could have devastating effects on already damage-stricken regions.